Whiteparish is an attractive small to medium-sized village centred on the A27, in South-East Wilts; surrounded by farming country and woodland; and near to the border with Hampshire. According to Wiltshire Council, our population in early July 2015 was 1504; and our nearest towns/cities are Romsey, Salisbury, and Southampton. Click here for more about the locality, and here for more about Whiteparish's history. Nowadays many villagers work in the nearby towns or further afield (commuting to London or to Bristol, for example). However, there are also several local employers within the village; and quite a few one-person businesses. Click here for a list of some local businesses. We have a church (C of E); a village shop/Post Office; a go-ahead primary school; a flourishing and forward-thinking medical practice; a filling station (at least we used to—it's not currently selling fuel); many village clubs, societies, and organisations; sports clubs; the Memorial Ground (a large recreation ground with a childrens' playground and facilities for tennis, football and cricket); and in one corner of it our new multipurpose Memorial Centre, combining the functions of a sports pavilion and village hall. Last, but definitely not least, there are two pubs! The most recent month's 100+ Club draw results are available here. At the time of writing, Wiltshire Council's online calendar of Rubbish and Recycling collections is out of action, but the relevant web page has this notice: "Please note there is no change to collection days over the Easter period." So there will be a rubbish collection as usual on Friday 19th April 2019 (Good Friday). SWAB TO MEET IN WHITEPARISH, May 1st. WILTS P & C COMMISSIONER STANDING DOWN. Angus Macpherson, Police and Crime Commissioner for Wiltshire and Swindon, has decided not to stand for re-election to the post of PCC in 2020. The position of an elective PCC was created to replace Police Authorities in 2012. Mr Macpherson, who served as a magistrate member on the local Police Authority for seven years prior to the change, was elected as Wiltshire and Swindon’s PCC in 2012 and then re-elected in 2016. He will be stepping down from the position in May 2020 once a new PCC has been chosen by the public. For more information, see this Community Messaging item. RECORD AUDIENCE FOR BOHEMIAN RHAPSODY. The enthusiastic volunteers who run Whiteparish’s "Parish Pictures" were delighted when their 6th April showing of Bohemian Rhapsody attracted a full house of 80 keen movie-goers (or Queen fans—or both) on a drizzly Saturday night. This was by far the biggest attendance yet for one of their popular movie evenings, and we noticed a fair sprinkling of folk from surrounding villages in the audience. Perhaps we can look forward to further offerings in the same genre? These Saturday-night picture shows are not just good fun and of commendably high quality but it’s all in a good cause, because as described on the website's Parish Pictures page, "surplus funds may be used for improvements to our presentations and for donations to local charities". After the show, Parish Pictures’s John Herrett told us "It’s very rewarding for us to get that sort of turnout, and I hope that it will translate into more customers for the less well-known films too". SECOND WRITING AWARD FOR FORMER WHITEPARISH MAN. 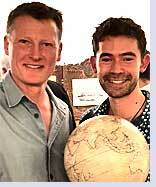 Following his recent award as "Young Writer of the Year" for 2018 (as we reported earlier), Adam Weymouth (on the right in the photo, holding his trophy), son of Whiteparish residents Keith and Sally Weymouth, has now also won the Lonely Planet Adventure Travel Book of the Year (2019) award for his book Kings of the Yukon (published by Particular Books). The Lonely Planet Adventure Travel Award is one of a number of travel writing awards in various categories that are sponsored by Edward Stanford Ltd.
£3 MILLION LOST BY PET FRAUD VICTIMS..
A notice from Action Fraud warns that fraudsters are posting advertisements for non-existent animals and pet accessories online. Action Fraud have received thousands of reports with victims reporting a total loss of over £3 million. For more information, click here. HELP SUPPORT THE MEMORIAL GROUND TRUST. The Whiteparish Memorial Ground Trustees have asked us to bring to your attention a way of supporting this local charitable trust at no cost whatever to yourself, as long as you are an Amazon customer. For more information, click here. CYCLING EVENT ROUTE INCLUDES WHITEPARISH. On 30th March 2019, a cycling event with a title something like "the Wiggle New Forest Sportive 2019" will be passing through Whiteparish, taking in the A27 (Romsey Rd), The Green, Dean Lane, and Ashmore Lane. Exactly when the bulk of the participants will go through the village is difficult to say, but we're about a third of the way along a roughly circular route of 100 miles, and the event is scheduled to start at 0630. Apparently it won't cause any road closures, but we can probably assume that there might be some brief hold-ups to ordinary traffic during the period that the majority of riders will be passing through. For a map showing the route, click here. For the Organisers' website, including a short description of the event (there are three different routes, the one that goes through Whiteparish being the longest), click here. SEEKING IDEAS FOR LOCAL HEALTH-RELATED PROJECTS. Healthwatch Wiltshire, the consumer champion for health and social care services in the county, is launching a small grants scheme to invest in projects that aim to improve the health and wellbeing of local people. The Community Cash Fund will enable groups to apply for up to £2,000 to start projects in their local community. The scheme will help Healthwatch Wiltshire get more feedback on health and social care services from people it might not otherwise hear from. Healthwatch Wiltshire Manager, Stacey Plumb said: "This is a great opportunity for groups to get funding for projects that will really make a difference to health and wellbeing in their community. We are keen to hear from anyone who has an idea for a project, no matter how small. This scheme will help us gather more people’s experiences of local services, and help ensure that their voices are heard. We’re really excited to see what ideas people have and how we can help make them a reality." It’s the first time Healthwatch Wiltshire has run the Community Cash Fund, but projects funded by other Healthwatches in the South West include: dance classes, art groups, health exhibitions, pop up cafes, support groups, music sessions and healthy eating cookery groups. For more information and an application form, click here. Simply fill in the application form and return it to Healthwatch Wiltshire; applications must be received by 5pm on Friday 29 March. BBC "BACK IN TIME" SERIES. 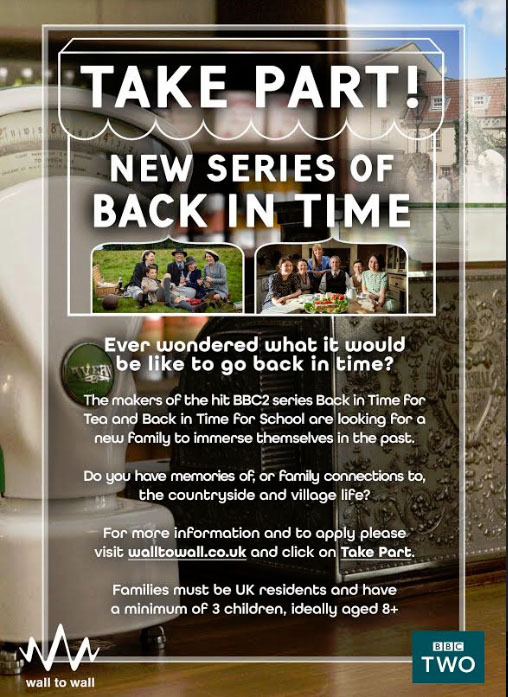 The makers of the BBC2 series "Back in Time for Tea" and "Back in Time for School" are looking for a new family to immerse themselves in the past. On their website at the time of writing, applications are shown as still open, so if you are interested in volunteering to take part it may not be too late to apply. Brief details are on this poster, which also includes the address to contact for more information. TEMPORARY CLOSURE OF COMMON ROAD. Wiltshire Council has notified that Common Road will need to be closed to enable the council to carry out "edge overrun works" and improve roadside verges. The work is scheduled to start on the 10th April 2019 and the road may need to be closed until 19th April. Hopefully, most internet users these days are aware of the need to be always on the alert for people (and organisations) who may try to contact you using a false identity, gain your trust, and cheat you—but new and less experienced users can be vulnerable, and more so at particular times in their lives (or times of the year). Hence a recent press release from the police Action Fraud unit, issued the day before Valentine’s Day 2019! To find out how to avoid being a victim of "dating fraud", click here to read the press release in question, where there’s also a link to an example of a dating fraud letter. Whiteparish residents are invited to come to the Annual Parish Meeting, which will be held on Tuesday 19th March at 7.30 pm in the Memorial Centre, and meet their Parish Councillors. Everyone is welcome. Although it is chaired by the Chairman of the Parish Council, the Annual Parish Meeting is just that—a meeting of the parish. If you have any concerns or wish to raise a particular local matter, then why not come to the meeting and have your say? If you are unable to attend but wish to raise any village matter, please inform the Parish Clerk at maria.pennington456@btinternet.com or telephone her at 01722 711858. HOUSING NEEDS IN SOUTH WILTS. – Have a say on what type and how much affordable housing is needed locally. – Receive information on what the council is doing to promote more housing. – Get an update on the housing waiting list, broken down per parish, how this is identified; i.e. neighbourhood plans, allocated housing sites, process for updating the core strategy. For more information please contact karen.linaker@wiltshire.gov.uk or phone 01722 434697. WILTSHIRE CRIME FIGURES FOR 2018. At a time when overall crime figures are increasing, it's good to find that Wiltshire Police were one of just four police forces nationally to see a reduction—only of one percent, but at least it's in the right direction. For comments by Wiltshire's Police & Crime Commissioner Angus Macpherson, click here. For statistics freaks who would like to study the full report from the Office of National Statistics, click here. TEMPORARY CLOSURE OF MOOR LANE. Wiltshire Council has notified that Moor Lane (Part of), Whiteparish, will need to be closed from its junction with Timberley Lane to its junction with the A36 from 11th February 2019, and it is anticipated that the closure will be required until 22nd March. This is to enable Southern Gas Network to install a new gas main. For further information, contact Sally Merrett (Southern Gas Network) on 02392 624120. Whiteparish Surgery’s services for local carers have been recognised for the sixth year running with an award from the Wiltshire Investors in Carers GP Accreditation Scheme, and this time it's the recently introduced Platinum Award–the highest level–added to the scheme in recognition of the outstanding carer support provided by many Wilts GP practices. According to the citation, the award is for the "outstanding services and support that Whiteparish Surgery provides to carers". Just one example being the programme of quarterly Saturday-morning Carers’ Coffee Mornings held between 09:30 and 11:30 am—the next one is scheduled for Saturday 23rd February 2019. The awards scheme is funded by Wiltshire Council and the NHS Wiltshire Clinical Commissioning Group and aims to raise awareness of carers’ issues in GP practices, with a system of awards to recognise support that the practices provide for carers. To achieve an award, practices need to be able to meet more than a dozen requirements that include maintaining an up-to-date carers’ register, have a Carers’ Lead, provide flexible appointments for carers, and hold a minimum of one carers’ clinic per year. The clinics are run in partnership with the CSW Community Connector Team. For more information about the surgery's services for carers, click here to go to the relevant section of the surgery website. If you are a carer, there are many advantages in registering the fact that you fulfil that role. For further information please ask to speak to Kim Munro (Carers Lead) or Justine Parsons (Deputy Carers Lead). The photo shows Carers Lead Kim Munro, who has been closely involved with the surgery's work for carers from the beginning, with the surgery's most recent Platinum Award. The South Wilts Area Board (SWAB)—whose coverage includes the parishes of Alderbury, Britford, Clarendon Park, Coombe Bissett, Downton, Firsdown, Grimstead, Landford, Laverstock, Ford and Old Sarum, Odstock, Pitton and Farley, Redlynch, West Dean, Whiteparish, and Winterslow— will be meeting in the Whiteparish Memorial Centre on 31st January 2019, starting at 7.00 pm, with refreshments and "networking opportunity" from 6.30 pm. The Area Board welcomes and invites contributions from members of the public, and the chairman will try to ensure that everyone who wishes to speak will have the opportunity to do so. For the agenda, with links to other related information, click here. CONSULTATION ON "VISION FOR SPECIAL SCHOOLS"
Wiltshire Council welcomes the views of parents, carers, pupils, staff and the public on its vision to transform special needs education. The statutory consultation into the future vision for special schools in Wiltshire is now online. People are encouraged to send in their views on the council vision to transform special needs education. For more information, including links to ways to contribute your views, click here. PCC WANTS YOUR VIEWS ON LOCAL POLICING. "Would you be prepared to pay an extra two pounds a month for more police officers?" That's the question being asked by Police and Crime Commissioner (PCC) for Wiltshire and Swindon, Angus Macpherson. PCC Macpherson is looking for the views of Wiltshire residents on the proposed average increase of £24 a year (for an average Band D property) to the policing precept. The policing precept, which is collected with your council tax, goes directly to the Police and Crime Commissioner where 98% is allocated to the Chief Constable and the remaining 2% to the PCC’s office for commissioned services which includes supporting victims of crime and restorative justice. Currently, the average Wiltshire household contributes £15.19 per month to local policing, but if residents and local businesses back the proposal then this would rise to £17.19 per month. The PCC said, "Last year, with residents’ support, I promised to maintain frontline policing numbers after several years of seeing a decrease. I also pledged to continue investing in mobile technology allowing officers and staff to work in the community. This year, if you agree to this precept rise, I will recruit 41 more officers and 2 dedicated cyber-crime staff." FAKE EMAILS ABOUT TV LICENSING. "Action Fraud has received more than 5,000 reports about fake emails and texts purporting to be from TV Licensing. The messages contain links to genuine-looking websites that are designed to steal personal and financial information. Always question unsolicited requests for your personal or financial information in case it’s a scam. Never automatically click on a link in an unexpected email or text. For more information about how to stay safe online, visit cyberaware.gov.uk". As from 7th January 2019, a six- to eight-week programme of refurbishment is ongoing at the surgery, to extend and refit the dispensary and replace all the sink units in the clinical rooms. According to Practice Manager Hilary Jenkins, the staff have planned carefully to minimise disruption to services: the surgery will not be cancelling any clinical sessions during the work, and will be able to offer the same number of appointments as usual. She comments that as with all building projects, the surgery are braced to expect that the unexpected may happen, but are confident that "the end result will certainly be worth it!" FORMER WHITEPARISH MAN WINS TOP WRITING AWARD. Adam Weymouth, son of Whiteparish residents Keith and Sally Weymouth, has just been named 2018 winner of the prestigious Sunday Times/Peters Fraser + Dunlop Young Writer of the Year award (in association with the University of Warwick), which recognizes the best work of fiction, nonfiction, or poetry, in the view of the judges, by a British or Irish author aged beetween 18 and 35. Adam’s book Kings of the Yukon (published by Particular Books) describes a three-month canoe trip through the rugged and remote Yukon territory of northwest Canada, looking for the king salmon of the title. According to the award's website, the three judges backed the award with unanimous enthusiasm. Andrew Holgate, Literary Editor of the Sunday Times, said "It feels as if we have found, ready minted and hidden in plain sight, a really outstanding new contemporary British voice—one who literary editors . . . almost completely failed to spot on publication." He went on to say: " . . .Weymouth combines acute political, personal and ecological understanding, with the most beautiful writing . . . He is, I have no doubt, a significant voice for the future." From 1 January 2019, not all bus passes will be renewed automatically. This is because there are approximately 20,000 passes in circulation that have not been scanned on a bus prior to renewal, indicating that the pass has not been used. In these cases the passes will not be automatically renewed. If your pass is not automatically renewed but you would still like to receive one to use in the future, please contact Wiltshire Council on 0300 456 0100 and we can arrange for your new pass to be issued. Wiltshire Council regrets that any charges which may occur on bus journeys are non refundable. If you know of anyone who may be affected by this change in the renewal procedure and is unlikely to have seen either this notice or the poster, you can download the poster by clicking here, and give them a paper copy. The South Wilts Area Board say "It would be great to see you at the Area Board on WEDNESDAY 28 November 2018" for their next meeting, which will be at Trafalgar School, Downton (so just down the road), starting at 7.00 pm. To see the agenda, click here. PARTIAL CLOSURE OF NEWTON LANE ON 10 JANUARY. Wiltshire Council have sent notice to the Parish Council of the closure of a 225-metre stretch of Newton Lane (from The White House in a north-westerly direction) on the 10th January 2019 for one day, though the duration of the closure may be affected by weather. The closure is necessary for renewal of a telegraph pole. For the full text of the notice, click here. For a map showing the affected section of roadway, alternative route, etc, click here..
On Saturday 8th December 2018, at 2pm, this £100,000 facility in the Whiteparish Memorial Ground will be formally opened by the young design team and Mrs Sarah Skeates, who initiated the project. Everyone is invited to the opening, come along and enjoy this marvellous new facility, whether a beginner or expert. The grant-awarding bodies will also be invited, along with the press and Wiltshire Council representatives. The skatepark was designed and built by Gravity Skateparks. The Parish Council is extremely grateful for the help given by Mrs Sarah Skeates, a local resident, who worked tirelessly and with great enthusiasm and dedication to accomplish the funding for the new skatepark. For the full text of this notice, click here. Here's yet another current public consultation, this time being conducted by Salisbury City Council on the subject of the city's 11 public conveniences. The council are seeking feedback about charging for their use, which toilets people use, their current state, and what users expect. For a list of the conveniences that the council maintains, including facilities and opening hours, with a link to the online survey, click here. The survey ends on December 12th this year. Whiteparish Surgery are organising a "How can we Help?" session to be held in the Memorial Hall on the morning of Saturday November 24th, between 9.30 a.m. and 11.30. Representatives from the following organisations (and more) will be providing advice and information: Parker Bullen (Will Writing and Power of Attorney), Extend Exercise, The Memory Box Project Group, Wiltshire Farm Foods, Travelling Dementia Suitcase, Healthy Landford Group, Wilts Fire & Rescue (smoke alarms), Carers' Support Wiltshire, Romsey Dementia Action, Music for the Mind, Admiral Nurses, Bobby Van (home security). Refreshments will be available. A month or so ago a villager contacted us about a letter they had just received describing an initiative from an organization called nextdoor.co.uk, for setting up a kind of online neighbourhood network in Whiteparish. Our contact was particularly concerned because although the letter purported to be from someone at another address in the village (someone that our contact didn't know), it was preprinted with what looked like a second-class stamp and a postmark, rather than the real (stuck-on) stamp they would have expected to see. Regular visitors to whiteparish.co.uk will know that we occasionally include advice about reducing the risk of being a victim of internet scams. However, despite our questioning some aspects of nextdoor.co.uk (as mentioned in the earlier story here), we're glad to report that as far as we can tell it doesn't seem to be one of these—it just has what might (generously) be described as an innovative method of introducing itself in new neighbourhoods as it grows. The preprinted envelopes are a legitimate Royal Mail product, and incorporate a so-called "digital stamp". So we've removed our earlier story. All the same, it seems unlikely that the folks behind nextdoor.co.uk will be setting up all these "free" neighbourhood networks out of the goodness of their corporate hearts! Best guess at the moment is that targeted online advertising will be introduced, perhaps sooner rather than later. Decision making – how we (the council) allocate your council tax to deliver services. Diligence – how we spend wisely and balance the budget. Difference – how we’re changing. Digital – how we’re making it easier for you to book, pay and do on line – when you want to. Devolution – how parish and town councils and communities can deliver more services locally. Delivery – how we will continue to do what we say we will. Refreshments will be available. Please email the events team (events@wiltshire.gov.uk) if you're interested in attending. Wiltshire Police are currently looking for feedback for developing their new Equality, Diversity, and Inclusion strategy, and to improve policing services in Wiltshire and Swindon. They have already held meetings in Swindon and Trowbridge, and are now taking bookings for a third public consultation meeting, for the South Wilts area, to be held in St Paul's Church Centre on the evening of Wednesday 21st November. For more information on this, including a facility for buying tickets and an online survey available for those who can't get to the meeting but would still like to provide input, click here. "Trick-or-Treating" can be fun for both the trick-or-treaters and the householders they call on—but only if the householders are OK with being trick-or-treated! For householders who would prefer not to have trick or treaters call on the 31st October (perhaps if you’re elderly, or for any other reason), Wiltshire Police have made a poster available that you can put in a prominent position by your front door. To download a printable copy of the poster, click here; for general advice about halloween from Wiltshire police, click here. "The results of the film choice ballot (see Parish Pictures page) were clear: the most wanted film from the short list was The Post, so we shall be screening this on 13th October. This will be followed by Three Billboards Outside Ebbing Missouri on 3rd November and Adrift on 8th December (provided it's been released by then). Once again we have Tony’s Frying Machine (new van version) visiting after the film on 13th October. It would be very helpful, please, if you would indicate whether you are likely to be enjoying a fish and chip supper with us afterwards: this doesn't have to be a firm decision, but it will help inform Tony about the stock level he needs. (Especially let us know, firm decision, if you want Haddock!) If you're buying your ticket(s) at the shop, tell them and it will be noted. As always, your feedback, comments and film suggestions are welcome." Following the retirement from responding of founder Martin Fisher and founder member Sheila Campbell, Whiteparish's Community First Responders have some vacancies to fill! For more on this story, especially if you might be interested in joining Whiteparish CFRs and being trained to help others in a medical emergency, click here. As part of Operation Sceptre—the national knife crime prevention initiative also launched this week (on Monday 17th September, 2018), bringing together police forces co-ordinating ways to tackle knife crime—Wiltshire Police are appealing for people to hand in unwanted or illegal knives and bladed weapons during the period of the amnesty: Monday 17th to Sunday 30th September. Special amnesty bins are available at six locations across the county: Swindon's Gablecross Police Station, Marlborough Police Station, Melksham Police Station, Chippenham's Monkton Park, Trowbridge Police Station and the Temporary Police Station at the rear of Five Rivers Leisure Centre in Salisbury. The knife amnesty gives people the chance to dispose of knives and weapons by simply taking them to one of the specified police stations and dropping them into an amnesty bin. During the period of the amnesty those handing in knives and weapons will not face prosecution for possession of a knife or weapon and can remain anonymous. For more details, and the background of Operation Sceptre, click here. THANK YOU – HAZEL & SID! On behalf of the whole village the Trustees of the Memorial Centre would like to express their heartfelt thanks to Hazel and Sid for almost 5 years of managing the Centre and the booking system. Sid in particular has gone well beyond his normal duties in setting up and packing away furniture for all the events big and small over this period. His help will be missed by many. Enjoy your retirement, Hazel & Sid – and those well-deserved holidays! Despite the challenging weather conditions, once again the 122nd village show — staged by the Garden Club in the Memorial Hall on 11th August — was a success. Well done to all of you who participated but we would like to see even more entries next year! Congratulations to all winners but especially to Malvin Ward who really stole the show this year; and to Alexander White who beat Hollie Smith by one point to win the Children's Cup. For the full list of award winners, click here. For a gallery of nice photographs taken at the event by Keith Hobbs (to whom many thanks), click here. John Glen, MP for Salisbury and South Wilts and Economic Secretary to the Treasury, was profiled in The Guardian on 28th July in a longish article which understandably concentrated on his views about the recent nerve-agent poisonings in Salisbury and Amesbury. You can read the article (by interviewer Decca Aikenhead) by clicking here. We don't normally have much to say about Westminster-level political figures in the website, but we thought it worthwhile to include this link because (a) John Glen is after all our MP, and (b) unless you happen to be a regular Guardian reader (not too many of 'em in these parts), you probably wouldn't have been aware of the article, and you might like to at least glance through it. The website now includes a gallery of photographs taken at this year's fete, which you can view via the link below. Please note a couple of points. (1) In a test viewing, the gallery was a little slow to load in the first place and occasionally hesitated before between images. This may be because out here on the fringe of the village our broadband performance is currently dire. Hopefully, people with faster connections will not have any problems. We'll still try to tweak the gallery images to improve loading speed, but it may be a few days before we can get round to it. (2) Photographs of village events on the website are always likely to feature villagers and others who attended, because it's hard to see any other way of conveying the community "flavour" of the event–without people there'd be no event! And we can't always ask permission at the time. But if you appear in a gallery photo and would rather not do so, just let us know who you are and which photo you're in, and we'll either remove the image altogether or crop you out! To go to the 2018 Fete gallery, click here. As regular readers and subscribers of Steeple & Street will already know, the July edition of our indispensable village magazine includes the "schedule" that specifies the classes for this summer's Flowers & Hobbies Show. But if by any chance you don't have a copy of the magazine, the schedule is also available as pdf files for downloading from this website. Click here for the top sheet, and here for the main schedule. From 30 July 2018 you will be able to recycle more materials at home! Under a new waste and recycling contract that starts on that date, you will be able to use your blue kerbside bin to recycle a wider variety of materials including clean food and drink cartons, as well as plastic pots, tubs and trays. For more information (including a few exemptions), see the Wiltshire Council website. It's also on the agenda for the 12th July Area Board meeting in Alderbury (see below). The next Area Board meeting is to be held on Thursday 12th July 2018 at Alderbury Village Hall, Rectory Road. The meeting starts at 7pm, everyone is welcome to attend. Plans and funding for a new skatepark (or "wheeled sports facility") to replace the old half pipe on the Memorial Ground are well advanced. For more information, with some introductory notes and sketches showing different views of the new facility, click here. THINKING OF ENTERING SOMETHING IN THE FLOWER & HOBBIES SHOW? The Garden Club's Flower & Hobbies Show for 2018 takes place on Saturday 11th August, which from memory is a slightly earlier date than in most recent years. We understand that the full schedule of classes will be published in the July and August editions of Steeple & Street (and hopefully on the website), but if you're thinking of entering something in the Art and Handicrafts classes and want to get working on it early, you can find details of those classes either in the June S & S or by clicking here. SUPPORT VILLAGE FACILITIES AND WIN CASH PRIZES WITH THE 100+ CLUB! With the end of the Club year fast approaching it is time for existing members to renew your numbers and an opportunity for new members to join this Club to raise vital funds to maintain the village facilities on the playing field—specifically the children's playground, the MUGA (multi user games area) and the Memorial Centre. Club members participate in the monthly Club Lottery with a prize fund of up to £100 as well as the special Christmas draw with prizes of £300. Existing members should follow the instructions in your renewal letter to continue for another year. To find out more about joining the club or renewing your membership, click here. HAVE YOUR SAY ON RURAL CRIME AND POLICING IN WILTSHIRE. (Extracts from an email sent by the neighbourhoodalert.co.uk website people.) "There are just a few days left for rural communities to have their say on crime and policing where they live. The National Rural Crime Survey comes to an end on 10 June 2018 and is asking key questions to ensure the voice of the countryside is heard. Do you think rural crime has gone up or down in Wiltshire? Do you feel safer? What’s your view of the police in your community? Three years ago the last National Rural Crime Survey revealed the huge cost of crime to rural communities—both financial, at £800 million per year, and fear, with chronic under-reporting, anger and frustration at the police and government. The National Rural Crime Network produced a series of recommendations and, in many areas, the police took steps to improve matters. So, now, we want to know what’s changed. We want to know the true picture of crime and anti-social behaviour in rural communities across Wiltshire—and the impact it has where you live or work." For more information about the survey you can read the whole text of the release by clicking here. Or to go straight to the online survey itself, click here. FAIRY MISSING FROM COMMON RD GARDEN. A Common Road resident has just emailed us with a sad and worrying story about the theft of a garden ornament (see left) of great sentimental value to her and her husband. She is particularly concerned in case this might be the start of a spate of such thefts in the village, and wants to warn residents to try to make their own garden ornaments secure. 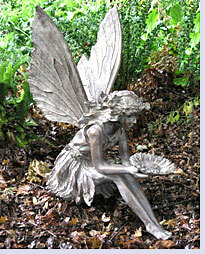 As she writes: "[the fairy's] dimensions are weight approx 4.5kg, height 54 cm. We are extremely surprised that someone who walks past our garden has seen it and decided to come into our garden and take it. We have reported the theft to the police but are concerned that now this has happened maybe other things may be taken by this opportunist . . . I would ask if anyone has seen anything or knows of someone that has recently acquired a fairy, where they got it from? We would really love to get her back. We are extremely upset and are now concerned that this type of thing could happen again in this area." It seems possible that Whiteparish might have a higher-than-average proportion of TSB Bank customers, since the former Lloyds Bank branch in Romsey became a TSB branch fairly recently. But whether or not that's so, TSB customers need to be aware of recent increased activity by fraudsters hoping to take advantage of TSB's recent difficulties with its online banking services. Action Fraud reported an increase of 970% in attempted phishing attacks on TSB customers during the first 3+ weeks of May 2018, compared with the same period in the previous month. For more details of how to avoid being taken in by the phishing attacks just referred to (and "smishing attacks", too), click here to see Action Fraud's notice in full. The next meeting of the Southern Wiltshire Area Board (SWAB) will be held at Pitton Village Hall on Thursday 3rd May, at 7.00 pm. To see the agenda, click here. At a meeting of the Wilts Southern Area Planning Committee held on April 12th 2018, the commitee passed planning application 17/12499/FUL & 18/00274, relating to the following proposed work at the King’s Head: "Single Storey Rear Extension (Orangery) to Pub Building & Separate Barn Conversion/Restoration with extension to provide Lodging". BEAST FROM THE EAST 2 = NOT SO "MINI". After what the press called "the beast from the east" gave us a pretty good snowfall at the beginning of March, we were promised what they rather unoriginally called "the Mini-beast from the east" a couple of weeks later. And it duly turned up on the night of 17th/18th March. 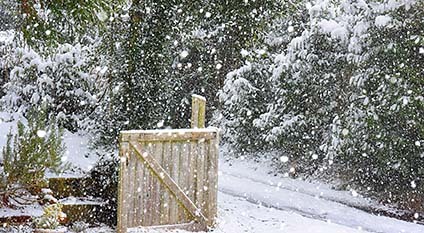 The forecast had suggested it would peter out in the early hours, but it didn't, and when we opened the back door at 8.00 a.m. it was coming down in bucketfuls (see pic). Thawed somewhat during the day, but forecast suggests there's more to come overnight. We'll see! GOING TO THE TIP? DON'T FORGET YOUR ID! Wiltshire Council's Waste Management dept are introducing a proof-of-address scheme at Wiltshire's recycling centres, which will of course include the Household Recycling Centre on Salisbury's Churchfields Industrial Estate. From the 9th April 2018, if you want to use any of the county's recycling centres you may be asked to provide proof of address, such as your driving licence, a county tax bill, or a utility bill. This policy is being introduced "to ensure that access to sites is protected for those people resident in the Wiltshire Council area. Dealing with waste is becoming increasingly expensive and as these sites are funded by Wiltshire Council tax payers we need to ensure that we do not incur costs associated with receiving waste from people from other council areas. People who do not pay their council tax to Wiltshire Council should use the sites provided in their own local authority area." For more information, see the Salisbury Recycling Centre's web page, which includes links for downloading PDF files for summer and winter opening hours. OPEN SPACE IN HIGHLANDS WAY. Wiltshire Council's Countryside Team is looking for volunteers to help look after the small area of green space at Highlands Way. Could you help them? This small wooded area is on the right hand side as you enter Highlands Way. It's excellent for nesting birds, and as it contains several fruit trees it is also a good food source for wildlife. Please contact them if you'd like to get involved as a volunteer–families also welcome–to help look after this site for wildlife and nature conservation. With no previous experience necessary and no long-term commitment required, this provides a great opportunity to get out and about, meet new people and gain new skills as you try your hand at a variety of fun conservation tasks. Work would involve cutting back overhanging vegetation, keeping the path clear of nettles/brambles, and a litter pick. We'll also see whether the area would benefit from bird or bat boxes, and look at ways that we could enhance it further for wildlife. Our next Conservation Working Party dates are as follows: Thursday 15th February, Thursday 5th April, Thursday 30th August, Thursday 27th September. Interested? Please contact the Countryside Team by emailing mailto:countryside@wiltshire.gov.uk<, or telephoning 01225-718647. The countryside team say a big thank you to the conservation volunteers that came along to help clear back vegetation and bring the area back under control before Christmas, we couldn't have done it without you! REVD. NILS BERSWEDEN MOVING ON. "The Bishop of Southwark has invited the Revd Nils Bersweden to be the Associate Vicar at St. Mary’s Wimbledon in the Diocese of Southwark. Nils will take responsibility for a pastoral portfolio to develop lay ministry, vocations and pastoral care at St Mary’s. The appointment is subject to the usual statutory checks, after which Nils will be licensed on 5th February 2018. Nils’s last service will be a Team Eucharist on 7th January at All Saints’ Winterslow." According to Steeple & Street, that last service will be followed by a "Bring and Share" lunch in Winterslow Village Hall and if Nils or Judith have touched your lives, you may like to be there. According to the Clarendon Team's website the service will be at 10.00 am, but it may be a good idea to recheck that website closer to the time, or to check the January issue of Steeple & Street. In a setting that's very different from the rural Clarendon parishes, St Mary's Wimbledon is an imposing and handsome Victorian church. It was designed by George Gilbert Scott, who was responsible for many well-known buildings in that era, including the Albert Memorial and the Foeign and Commonwealth Office. And for a piece of popular music trivia tenuously associated with St. Mary’s, click here. This is just a reminder about the 100+ Club Christmas Celebration and Double Draw this Saturday (9th). If you haven't yet bought your tickets at the shop, please either do that soon or or let us know by return if you'll be buying them on the door, as this will assist greatly in our catering arrangements. For those of you who already have tickets, I'm sorry to clutter your inbox, thank you for your support and we look forward to seeing you on Saturday!. The Trustees invite all Whiteparish residents and users of the Memorial Ground and Centre to attend the AGM on Saturday January 20th at 10:30 in the Cowesfield Room. The Whiteparish Memorial Trust is your charity, please attend to hear details of the Trust’s activities in 2017 and help shape the events planned in 2018. Looking a long way ahead, Wiltshire Council have launched a six-week consultation to "Help shape Wiltshire's plans to 2036", by gathering comments to feed into their Local Plan Review. The consultation period started on 7th November and closes at 5.00 pm on 19th December 2017. For more details, click here to see the Notification Letter. HALLOWEEN IS CREEPING UP ON US . . ..
. . .say Wiltshire Police. For some Halloween-related advice sent out by Katrina Fleet (Police Communications Officer, Wiltshire), including some tips from Superintendent Phil Staynings, Head of Crime Prevention, click here. For a poster to display if you don't want to be Trick-or-Treated, click here. DO YOU WEAR A HEARING AID?. If you wear an NHS hearing aid from Salisbury Hospital, you may be interested to know about a new "Hear to Help" walk-in hearing-aid clinic to be run on the third Friday of every month at Alderbury Village Hall between 1000 and 1130 am. Services and topics covered will include new batteries and earmould tubing; advice on using and cleaning your hearing aid, and information on hearing loss and the services that can help you. For full details, click here. Wiltshire Council are currently running an online consultation about parking charges in the county. According to the Salisbury Journal ( 5th October) the council wants to increase parking charges by an average of 12%. So you may want to contribute to their consultation on the proposal by clicking here. The consultation period ends on 23rd November. DO YOU FEEL SAFE ONLINE?. Anyone over 60, or over 18 and registered disabled, is elegible for online safety advice from the Wiltshire Bobby Van Stay Safe Online team of police-trained and vetted volunteers. For more details of what they can provide, and how you can book an appointment, click here. Following last year’s very successful Winter Ball, raising nearly £2000 for the improvements to the play area (we hope you have seen the new equipment), The Whiteparish Memorial Trust is organising the second Winter Ball, at the Memorial Centre, on Saturday 2 December 2017. The objective of the event is to raise funds to make improvements to the kitchen at the Memorial Centre. If you are a Memorial Centre user or a club, group or organisation that uses the kitchen we hope you would like to support this event in some way. Following last year’s very popular raffle prizes of Christmas hampers we are repeating this again. We are asking for items to fill them. We wondered if you could donate items, either individually or as a group which would help us in this endeavour. For the whole of the Winter Ball committee’s letter, including details of how to donate hamper items, click here. TEMPORARY CLOSURE OF CHURCHFIELDS RECYCLING DEPOT. Wiltshire Council have announced that the Churchfields recycling depot (at the end of Stephenson Rd) in Salisbury will be closed for a ‘revamp’ between the 9th and 18th of November, inclusive. This is part of a rolling programme of work affecting many (possibly all?) of the recycling depots in the county. For more information, including which alternative recycling depots will be available while the Salisbury depot is being refurbished, click here. PARTIAL CLOSURE OF MOOR LANE, STARTING 4 OCT 2017. Wiltshire Council's Sustainable Transport Group have announced that about 1.25km of the length of Moor Lane, from the junction with Grove Lane/Timberley Lane to near Titchborne Farmhouse, will be closed to all traffic for between two and five days, starting on 4th October 2017. For more details, click here to see Wilts Council's notification in full; and click here for a plan highlighting the affected section of road. Mother, husband, grandmother, brother? Teacher, office manager, student, electrician? If you are looking after someone who couldn’t always manage without your help: someone with a physical disability, long term health condition, mental health issue or a problem with substance misuse, you may also be a carer. Juggling a caring role around work, studying, seeing friends or spending time with other family members can be challenging. And sometimes it can feel lonely. Carer Support Wiltshire are a local charity supporting unpaid carers in Wiltshire. Our Carer Cafes and Support Groups are held throughout the county and offer information, advice and the opportunity to make new friends over a cuppa. Visit our website to find one near you or call us on 0800 181 4118 or 01380 871690 from a mobile for a copy of our "What’s On" guide. Note: Whiteparish Surgery hosts a Carers’ Coffee Morning every other month, on a Saturday morning. For dates and times, check the Forthcoming Events lists in the website or Steeple & Street. At the time of writing, the next one will be in October 2017. Officers in the South of the county have been taking part in an operation targeting rural crime and poaching. As part of Operation Engage, two rural operations were run, in August and early September. Over 130 vehicles were stopped as part of the operations for various issues including vehicle defects. Operation Engage aims to tackle rural crime in the county and saw officers involved from the local Community Policing Teams, Tri-Force, the volunteer Special Constabulary, Intel and further support from neighbouring forces Dorset and Hampshire police. Click here for more on this story . . .
BEWARE THIS KIND OF "MALWARE". Today we received an email with the subject line "Your Virgin Media Bill is ready", apparently sent from a Virgin email address: webteam@virginmediaconnections.com, and the message content certainly did look like a bill. Except that we're not Virgin customers, Virgin hadn't sent it, and the message wasn't a bill, just a "phishing" expedition designed to get internet users to click on a link in the message. Clicking would have resulted (eventually) in downloading a trojan virus (in this case the Dridex banking trojan) that would have allowed the originators to access banking details from our computer. Internet users with Virgin accounts will be more susceptible to this particular scam than other users, but the criminals who designed it are likely to target customers of other internet providers, too, using the same style of "bait". So the usual general advice applies: if you receive an email that you weren't expecting from an organisation you haven't dealt with before, and it contains links (or has an attachment), never click on the links or download the attachment unless you are absolutely certain that it's OK. Just delete it. Same goes for an email that seems to be from an organisation you have dealt with before. If there's anything remotely suspicious about it–for example unlikely amounts, awkward language, unfamiliar format, etc–delete it. Don't click on any links or buttons unless you're absolutely sure it's genuine–just delete. And never click on anything in an email from a suspicious or unknown source "just to see what happens!". Wiltshire Council's Libraries and Heritage, Communities and Communications Dept are carrying out what they describe as a "routine review" of the county's mobile library routes and have asked for comments from Parish Councils and communities on the proposed mobile library schedules for our area. They want to "engage with as many people as possible who may wish to comment on the review". The consultation documents are available to view online from the Wiltshire Libraries webpage at http://services.wiltshire.gov.uk/MobileLibrary/, and happily Whiteparish is unaffected by the changes: it seems that the mobile library will make the same stops here, at the same times, as before. (The nearest route change to us is a proposal to drop the stop at Alderbury School, Firs Road.) The consultation period is from 4th September to 4th November 2017, and the council hope to introduce revised routes in February 2018. There is a need to take on the maintenance of our Rights of Way as Wiltshire Council do not have the resources to do so. Do you like walking in our beautiful countryside? Would you like to help improve, maintain and preserve our Rights of Way? There will be a volunteer work party during September, most probably a Monday, and will involve clearing overgrown vegetation using hand tools along with installing a number of new kissing gates which the New Forest National Park Authority have very kindly funded. Details of the exact location will be given closer to the day. There are no particular skills required and any help will be much appreciated. 2017 FETE A FINANCIAL SUCCESS, TOO. When all the pennies had been counted, this year's fete committee were very pleased to learn that the fete, hog roast and bands night had together made a profit of £8,453.08, which will be shared equally between the School and the Church. This was just a shade down on the total from the same events in 2016, but an excellent result all the same—many thanks to all those who contributed in any way. For a final report, click here. For some photos, click here. We've added three new photo galleries to the website. They cover the 2017 Fete, which took place on 17th June, the Garden Club's visit to the garden at "Aviemore", in Bartley, on the 22nd June, and the Garden Club's annual "Garden and Hobbies show, staged in the Memorial Hall on the 19th August. Many thanks, as always, to Keith Hobbs for photographing the two Garden Club events. Congratulations to Mr & Mrs Holden and Diana Borwick who won the first prizes in the June and July 100+ Club draws. The full results are here. The prize fund has been slightly reduced following the fall in membership from 228 to 213. It is not too late to re-join or join for the first time. Details of the new prizes and how to join can be found here. Claire Perry, Minister for Climate Change and Industry, and MP for Devizes. Barry Gardiner, Shadow International Trade Secretary. Wera Hobhouse, Liberal Democrat MP for Bath. Julia Hartley-Brewer, radio presenter and journalist. GARDEN CLUB TRIP TO WELLS. On 25th May the Garden Club visited the Bishop's Palace Gardens in Wells, Somerset, on what was evidently a beautiful spring day. Keith Hobbs took a fine collection of photos there, which you can see by clicking here. The most recent Approved Parish Council Meeting Minutes (20th April 2017 meeting) and Notes (18th May Meeting) are now available on the website. Also added were the Parish Council accounts for 2016/2017. DON’T FORGET TO VOTE ON JUNE 8TH . . .
Just in case you hadn’t noticed (as if . . .) there’s a GENERAL ELECTION on Thursday 8th June. Don’t forget to vote for your candidate of choice to be our next Member of Parliament. The polling station (the Memorial Centre) will as usual be open for voting between 7.00 am and 10.00 pm. 2017 WHITEPARISH FETE, AND ASSOCIATED EVENTS. Each year, many individuals and organisations in Whiteparish work together to stage our annual Village Fete and other associated events. The Fete is definitely one of the highlights, perhaps the highlight, of Whiteparish"s year; and profits go to benefit All Saints" Church and All Saints" Primary School. With the recent May draw bringing the current Club year to a close (results here) it is time for those of you who don't pay by standing order to buy your tickets for next year. Details of how to do so can be found here. If you are not yet a member and would like to support the village Memorial Centre, playground, etc then full details of how to join are here. Lucky winner of the top (£30) prize in 100+ Club's May draw was Linda Palmer. Other prizewinners are listed on the 100+ Club page: click here. RECENT MUSICAL EVENTS IN THE VILLAGE. We've recently received accounts and some photos of two musical events from the first part of 2017. Berny Higgins was kind enough to provide a review of Richard Digance's "50 years in showbusiness" concert in February (click here), and the Whiteparish Music Festival committee kindly provided a review of their recent successful Festival events at the end of April (click here). Notes of the 20th April 2017 meeting. DON'T FORGET TO VOTE ON MAY 4TH . . .
. . .for our representative on Wiltshire Council for the next four years. The polling station (the Memorial Centre) will be open for voting between 7.00 am and 10.00 pm. SEEN FROM OUR FOOTPATHS . 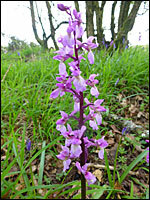 . .
Richard Burr has sent a nice collection of photos (including the ones above) that he took on a recent walk. Our village has some spectacular wildflower displays at the moment which are easily found by using the village footpaths. 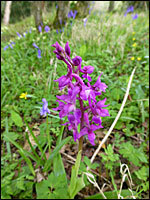 Carpets of Bluebells, Primroses, Wood Anemones and even Early Purple Orchids can be seen along some of the paths. There are some more of Richard's photos in our Galleries section which you can see by clicking here. All the photos were taken from Paths 10 and 35 in the village over the Easter weekend. Path 10 starts at the Parish Lantern, passes Blaxwell Farm and goes on to Park Water Road. Path 35 also runs from Park Water Road. There is a map of village paths on the website, which you can see by clicking here. The fortnightly blue bin and black box recycling collections will be unaffected by the Bank Holiday on Good Friday (14th April); and will take place as for a normal Friday. Wiltshire Council would like you to know about "a lot of changes" that they've made "to deliver the services that matter to you, in your community." To find out what they are, click here. MUSIC FESTIVAL (22nd to 29th April). The 2017 Whiteparish Music Festival will include four different events taking place over eight days at the end of April, featuring a "Come & Sing" day, a concert given by Whiteparish School Pupils, an instrumental concert with contributions from two local ensembles (Solent Accordians and the Courtyard Wind Quintet), and a concert of light and sacred music from Sarum Six (ex-cathedral choristers). For full details, see our Music Festival mini-site. VOTING IN THE UNITARY ELECTION. If you want to cast a vote in the Wiltshire Unitary Council Election on May 4th, 2017, and you're not yet registered to do so, there's still time—just! If you want to vote in person, you need to register by Thursday 13th April; for a postal vote, the deadline for receipt of new postal vote applications is Tuesday 18th April. In either case, you can register online via this page on the Wilts Council website. You can also see a list of candidates for our Alderbury and Whiteparish ward (pdf format) by clicking here. ARTISTIC CLUB THEMES THIS MONTH. March 2017 sees two local club meetings featuring painters—albeit from different eras and in different contexts. On Wednesday 15th (2.00 pm in the Cowesfield Room) well-known wildlife painter Kim Thompson will be the featured guest of the Breakaway Club. And on Thursday 23rd starting at 7.30 pm also in the Cowesfield Room, guest speaker Jennifer Carter will be telling the Garden Club all about "Monet's Home & Garden at Giverny". If you're interested in either of these talks, we understand that both clubs welcome visitors, but there may be a small fee for tea etc. Notes of the 16th February 2017 meeting. MILITARY-STYLE ENCAMPMENT SPRINGS UP ON MEMORIAL GROUND! In a way, despite appearances, it was the opposite of "military". We understand that the day, organised by the "Serve On" organisation, was an exercise in emergency planning, logistics, communications, etc for civil volunteers who would be called on to help in those areas, in the event of a major incident. However the tents that had appeared alongside the Memorial Centre on Saturday 25th February were government-supplied, which accounted for the military look. The "camp" was only in place for one day—by Sunday morning it had disappeared almost without trace. Our intrepid reporter ventured onto the site after picking up the Saturday paper and was told she was the only villager to have taken much interest—up to that point, at least. (Perhaps Whiteparish folk in general are a bit short of curiosity on Saturday mornings?) Anyway, she was shown around and acted as a guinea pig for some of the procedures in use. The person in charge of the reception area was quite pleased to book in a real human, having been practicing until then by booking in lego models! We're hoping soon to include an official description of what the exercise was all about, but in the meantime there are a few photos in the galleries section. 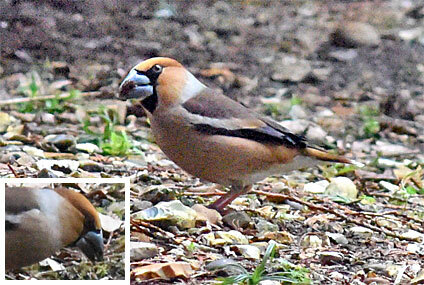 VISIT FROM BRITAIN'S BIGGEST FINCH. The other day we had a visit from a pair of birds that neither member of the website team had seen before: they turned out to be hawfinches, the largest member of the finch family to be found in the UK. According to the RSPB there are only something between 500 and 1000 breeding pairs here, though up to 15,000 individuals may be winter visitors, so they're quite rare—and rather shy. A very keen amateur ornithologist we know who's in his sixties has only ever seen one, and was quite envious! They are very handsome birds with rich chestnut plumage on their heads merging into a kind of pinky fawn elsewhere, and have massive, powerful, beaks that can crush seeds up to and including cherry stones. We took a few photographs through the kitchen window. The large one above is the best of them, but because the bird was in deep shadow we lightened the image a bit–the inset photo gives a better idea of the rich brown head-plumage. Plumage can vary depending on whether the bird is male (slightly brighter) or female and whether or not it's the breeding season, but there's no mistaking that beak! If like us you live at the east end of the village down the A27, look out for this pair; perhaps they'll visit you next! On behalf of Southern Area Board, I am delighted to invite you to "Our Community Matters". This really important conference will present new information about the Southern Wiltshire community area and give everyone an opportunity to shape the way ahead for our communities. Hear about what has changed in our community area in the last two years. The brand new Joint Strategic Assessment (JSA) will cover issues affecting our community area across health and wellbeing, community safety, the economy, transport, the environment, housing, older people, children and young people and culture. The assessment will allow us to see what has changed in our community area since 2014 so that we can decide what needs to change over the next two years. Help shape the future of our community. This evidence presented in the JSA will help us decide how we can formulate local projects to address local challenges and we need to hear your views about priorities and how we can work together to make the Southern Wiltshire community area a better place in which to live and work and to visit. Thursday 16th February 2017 at City Hall, Salisbury, SP2 7TU. Doors open at 6.30pm and the event starts at 7.00pm. Refreshments will be available. Sign up to come here. Attendance is by invitation to ensure we have a mix of people and organisations in the room to inform decisions and identify actions to tackle the issues facing the area. Our community really does matter and I do hope you will take part. As you probably already know if you live in the village, the King's Head is currently for sale and it is possible it could become a residential property, in which case it would be lost to the village as a pub forever. Most villagers will also know about a current initiative to try to raise funding to buy the King's Head and run it as a community pub. If by any chance you didn't get the initial flyer and questionnaire about the project, you can still get one from the village store, the school, or Courtens garden centre–the closing date for submitting completed questionnaires, by "posting" them at those same venues, has been extended (subject to permission) until the 28th January. The steering group have organised a public meeting to be held in the Memorial Hall on Sunday 29th January at 3.00 pm, where there will be presentations about the project, including initial findings derived from the questionnaires. If you'd like to see the King's Head re-open as a pub, please come to the meeting, where you will be able to buy a glass of er, something appropriate…. In the meantime, you can find out much more about the project background and aims by visiting its website: www.savethekingshead.org.uk. By late 2009, and then again in late 2012 and 2013, and then again in 2015, and again in 2017, the home page had grown to a ridiculous length (because we'd simply been adding to it for far too long). So there is a separate archive page for older material, which you can view by clicking here. Click here for our Forthcoming News and Events list, or see the diary sections for individual organisations. To suggest an event to be featured on the website, email us at events@whiteparish.co.uk. If you want to find out more about Whiteparish and what's going on here, whether you live within the village or elsewhere, we hope that this website will be useful and informative. If you find any errors or have any suggestions for improvements, please let us know by emailing us at comments@whiteparish.co.uk. For more information about why the website is the way it is, and what we hope to do with it in the future; or to tell us about what changes or improvements YOU'D like to see in it, follow the "About Website" link.